It’s a time of change for the largescale dairying operation managed by Neil Baker at Rushywood Farm near Crewkerne in Somerset. Closing the long-established but currently unprofitable block cheese-making operation last year has brought focus onto the liquid milk market. Bull selection has switched to emphasise yield rather than quality components; and the feed regime is being upgraded to help lift the current 10,500-litre average towards a 12,000-litre target. At the same time, the Kingruss Holstein herd continues to expand. Fifteen years ago, the business milked 250 cows; numbers had reached 600 when an 80-point rotary parlour replaced the 20x20 herringbone in 2005, and now the herd is over the 1,000-cow mark and growing still. "I've always believed there's a future for dairy, but to maintain a competitive and successful business we need a combination of scale and high-level animal welfare," says Mr Baker. "We've invested in modern, spacious buildings that are laid out to minimise the competitive tendencies among the cows, we have high comfort sand beds, and simply do what we can to best look after these lovely animals that have provided our family with a living for the past 80 years." Quality is clearly an important criterion for the business, which is evident from the high-spec tractors that handle the heavyweight mechanisation requirements on the farm. But quality comes in many forms and is as important for the humble scraper tractors as for those that help to bring in the forage. With a growing herd and three times a day milking, the farm's three TAFE 45 TDI OIB tractors have a busy workload. Two work pretty much exclusively on the dairy unit at Rushywood, while the third performs its duties on the separate calf-rearing unit where replacements are bred. "We used typical second-hand tractors until I got fed up with having the clutches replaced," says Mr Baker. "We also ran one with drum brakes, which are not ideal for the conditions a scraper tractor works in, before buying a new Chinese tractor that turned out to be wholly inadequate for the job." In contrast, the TAFE machines, built by one of India’s biggest manufacturers, Tractors & Farm Equipment, have proved not only nimble and efficient, but durable and inexpensive to run. 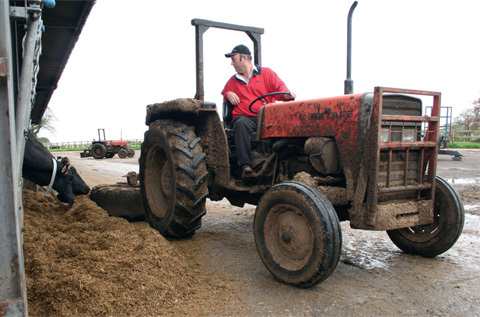 "A look through our invoices for parts shows the tractors have cost less than £190 per 1,000 hours of use." They are supplied to a growing number of British dairy farmers by Dorset-based Martin Richards of Tractors UK. "Cheap second-hand tractors suitable for scraping duties are becoming more difficult to come by," he points out. "If you get one, you start out with a part-worn tractor when for around £11,000 you can have a new and very much proven tractor with oil-immersed brakes and a warranty for two years or 1,000 hours." The TAFE tractors at Rushywood are worked hard and often; the eldest has clocked up more than 15,000 hours and the others are on 9,500 and 5,000 hours apiece. They are treated only occasionally to a wash-down and, Mr Baker admits, are serviced to a somewhat haphazard schedule. "Yet a look through our invoices for parts shows the tractors have cost less than £190 per 1,000 hours of use," points out Mr Richards. "That excludes parts replaced due to accidental damage, as well as tyres, service filters, oils and labour, which would be incurred whatever the tractor." None of Mr Baker's tractors has the optional cab – it makes them easier to get on and off; the driver has maximum visibility; and they mostly work under cover anyway, he says. "Besides, he points out. "It encourages drivers to work at a steady speed – go too fast and they get splattered." Bringing about change is never easy – and closing the family cheese operation was a tough decision. But with a passion for pushing standards across the board to improve herd health, well-being and performance, Neil Baker is clearly optimistic for the future of dairying at Rushywood Farm. "We are now crossing very high milk bulls with cows from 20 years' worth of breeding aimed at raising quality components," he points out. 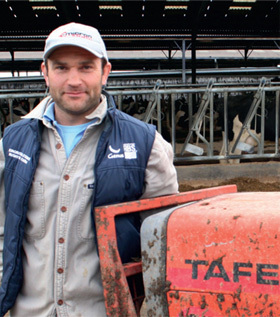 "The next generation should produce some very profitable milk that will sustain the business into the future." They're simple, reliable and durable, often clocking up thousands of hours; in fact, we know of some with more than 10,000 hours - they're a lot better value than buying a cheap second-hand tractor.